Purchasing or Selling property in Gatlinburg, Pigeon Forge, Wears Valley, Sevierville, Pittman Center, Cobbly Nob, Kodak, Seymour, Cosby, Newport or any of the wonderful areas in East Tennessee around the Great Smoky Mountains National Park or Douglas Lake is easy when you work with me as your licensed REALTOR®! As your real estate professional, I can assure you that your transaction is handled with honesty, professionalism, loyalty, integrity and care. NOTE: Click a photo to see more of that listing! Click on the sign at left. One-owner private estate in Chalet Village above Gatlinburg at the foot of the Great Smoky Mountains. The view is breathtaking from the finished, enclosed deck. Home has been maintained in like-new condition. The 14.4 acres is sub-dividable for investment and virtually no part of it is without the spectacular view of the main home. Nature is abundant and the bears come by to visit periodically. The plentiful windows throughout the home provide a light and airy feel: a one-with-nature sensation. Home is zoned for either Overnight Rental or Permanent Residence. Chalet Village has an optional HOA which gives owners access to the amenities of swimming, tennis, clubhouse, etc. Beautiful home on dead-end street in quiet neighborhood! Has been maintained with loving care as a 2nd home with a basement apartment leased at $625/mo. Apt has 2BR/1BA, separate LR, kitchen, washer/dryer hookups and outside entry. Although all 3 bedrooms on the main level and loft are very spacious and inviting, owner has thought of one of the upstairs bedrooms as the master since it has its own screened in deck which could also be glassed in for use as a private sitting room. This is a must-see, unique property you'll love at first sight! Beautiful home with charm, light from lots of windows, screened porch looking out to mountains, recessed lighting on dimmers (even an individual dimmer next to the master suite bed). This is country living at its most gentile. Bonus room has been used as office with shelves in the closet - easily removed for use as large closet again. All on 1 level with wide doors for adapting to handicapped accessible. Garage is 1.5 size for extra storage, workshop area, motorcycle, golf cart, whatever - also doubles as the laundry area. Yard is partially fenced for pets. The drive is paved up to the level yard area, then gravel to garage. Don't miss seeing this one. CEDAR & STACKED STONE w/ VIEWS! Rustic cabin constructed of 100+/- yr old logs with board/batten on front. Like walking into another era. Cabin has been kept as rustic as possible, but with updated amenities such as the whirlpool tub room, cable TV, internet. The spacious master suite is the entire upstairs with its own sitting/TV room and bath. The large deck is the ideal place for the first morning cup of coffee (or coctails in the evening). 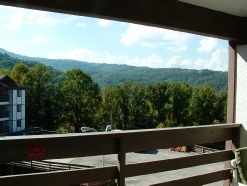 Easy access to Gatlinburg, Pigeon Forge, the Park and all the amenities therein. Plenty of paved parking/turn around space. You don't want to miss this one! IN THE WOODS AWAY FROM TOWN! Beautifully immaculate condo in walking distance of Parkway! Has been kept updated meticulously (see Assoc Docs for full list), including paint, carpet, appliances, A/C, crown molding and more! Living room has sleeper-sofa for extra guests. All furnishings are included for this extremely reasonable price. Sit on the deck and take in the view both day and night. HOA also includes Wi-Fi and trash disposal. Photos don't do it justice - a must see! CONDO WITH VIEW & WALK TO TOWN! This condo is in great shape and fantastic views!! It may need some minor TLC, but in general will make a wonderful second home or permanent residence. Easy access to shopping, Gatlinburg, and all area amenities without the cost. Beautiful amenities with a well maintained club house, pool, tennis court and basketball court. As a bonus, a waterfall is a must visit in the common areas of the clubhouse area. Walk and enjoy the country serenity of a gated area just for residents and guests. Mountain View! Easy access! Just off Jones Cove Rd. Build within the privacy of trees and the view to the East. This quiet, peaceful subdivision is just right for your permanent residence or second home (no overnights). Utilities are buried - including cable. Utility water tap is at property ready to be hooked in. The subdivision is small so not much traffic to disturb your morning or evening hikes. Neighbors are friendly and watch out for each other. LOT WITH A VIEW AND EASY ACCESS! 3 lots in prestigious Cobbly Nob sold as one piece so nothing can spoil your fantastic view - once cleared! Amenities include, tennis courts and swimming pools. Golfing is so close at hand you could probably walk. The atmosphere is one of gentile friendliness and quiet. Easy access to all the area entertainment of Gatlinburg and Pigeon Forge with the National Park right where you can see it on a daily basis. You'll love the area - take a look!! 3 LOTS IN COBBLY NOB 1 LOW PRICE! Exceptional 5.0 wooded acres with well, septic and electric already in place and a cabin foundation ready for you to build upon. The view promises to be spectacular once cleared and you'll have your own private sanctuary with nothing to do but enjoy natures wonders. Wild life abounds and will continually astound you with its almost endless variety. Don't miss this piece of East Tennessee - look and fall in love. Check out the beautiful lichen in the photos at the base of one of the trees. You never know what you'll find! Fantastic cabin within easy reach of Pigeon Forge, Gatlinburg and all the amenities therein and around! It's cozy and private (even more so during the summer). Partially furnished and ready for your own touches. Cathedral ceiling in living room/dining/kitchen area. Master BR on main level for convenience. A detached carport! Heat/AC is apx 2 yrs old and the metal roof is apx 3 yrs old. This beautiful home has been upgraded to the tune of over $70K since purchase. The change is unbelievable. A gorgeous mountain view greets you as you look through the front windows or stand on the deck. The landscaping and yard work is impeccable and needs only a flag to make it a putting green :). The neighborhood is very quiet and peaceful. There is no HOA, but all properties are very well maintained. 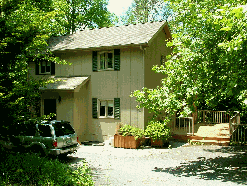 There is also easy access to the National Park, Pigeon Forge, and Gatlinburg with all the +++s there. Don't miss this beautiful property! 3BR/3BA BRICK IN QUIET NEIGHBORHOOD!